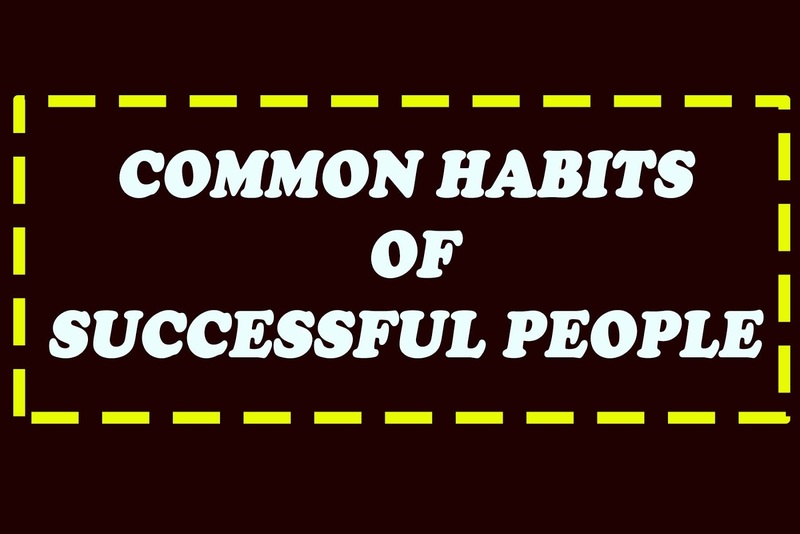 The successful people are the common man, but they have some habits which make them successful in life. Any person can be successful in life, but it all depends upon its attitude and habits. If you have some positive habits, then you will be successful in life, otherwise, you will be unsuccessful in life. The successful people do not have supernatural powers. They are like us but their habits make them different from us. In this article, I will talk about those habits which can also make us successful in life, but these habits do not make you successful in one night. It is a long process, but one day you will achieve your goal. 1. Reading: Reading is the common habits in all the successful person like Mr. Bill Gates and Mr. Warren Buffett. The reading gives a lot of knowledge to the reader, which helps the reader to be successful in the future. These successful people want one supernatural power. i .e. Reading Faster. If they can read faster then they can grasp more and more knowledge quickly. The Knowledge will automatically increase with time as money increased with compound interest. 2.Action: Successful people take the action very quickly. If they have any idea, then they take immediate action on it. It is the possibility that their idea can be failed, but they think that they can learn a lot from their failure. So they do not afraid of failure and they take it as one step towards success. While the normal person afraid of thinking about the failure and do not take any action. The normal person waits for a magical idea to become successful in life which is their biggest mistake in life. 3. Calculated Risks: If a person wants to succeed then he/she should take calculated risks. Suppose you are going to open a business, then there is not 100% guaranteed to be successful in that business. But you can save some money for your living such as House Rent, Food, and clothes if you fail in that business. This is called calculated risks. 4. New Skills: A successful person always ready to learn new skills. This makes their minds sharper. Almost every successful person has mastered one skill, but they always try to learn new skills. It makes them more confident and successful in life. 5. Hard Work: The hard work is the key to success. The successful people always ready to hard work. They did not take any shortcut for the success. They do not afraid of hard work. Actually, they love hard work. According to me, a person should do hard work as a smart work. 6. Wake Up Early: According to science, when a person gets up early, then the three parts of the brain (Hypothalamus Gland, Pituitary Gland, and Adrenal Gland) which control the stress are more active. So this helps the person to take the good decision, good planning, and best goal setting. That's why almost every successful person wake up early to get this power naturally. 7. Optimum Sleep: Every person should take the optimum sleep. In other words, the sleep should be neither less nor more. If you take less sleep, then it will create some problem for health such as the brain loses and heart disease etc. If you take more sleep then it will make you lazy and dull for the whole day. So sleep should be optimum. 8. Positive Attitude: The positive attitude helps us to be more focus towards goal and more creative in life. 9. Exercise: Exercise has many benefits which help us to become successful in life. Many people think that It is a waste of time, but they are wrong. According to science, exercise keeps us away from depression, anxiety, and stress. Moreover, the exercise creates more blood cells in our brain which make our brain stronger. So, if you want to succeed in life, then exercise is must for you. 10. Responsibility: The successful people always take responsibility for their actions. If they face failure in some task, then they did not put the blame on another person. They take responsibility for the failure and gives the credits of the success to every person who helps them to complete the task. Your habits will shape your life. If you have good and positive habits, then one-day success will be in your pocket. You will have the full control over your life. And, if you do not have good habits, then it will be a very tough task for you to be successful in life.